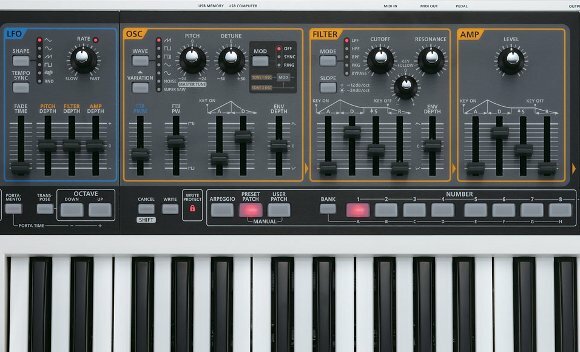 I liked the SH-201 when released – the accessible front panel of that synth, which exposes synth parameters as physical knobs, made it fun to use, and sure enough, a lot of folks snapped them up. But likable as it was, the SH-201 somehow lost some of the spirit of the SH-101 its name suggested, partly because it’s so, well, big. It was neither as compact nor as logically laid out as the original. Enter Roland’s new SH-01, and exhibit B that this year, Roland is listening. It’s a small but playable-looking, fun-packed little synth keyboard. And while the front panel on the SH-201 made some questionable decisions deviating from the wisdom of the SH-101, the Gaia SH-01 actually does take some of the best of its predecessor. The front panel it even organized the same way: from left to right, you control modulation, oscillators, and amplitude envelope. The SH-01 replaces the awkward controls to the left of the 101’s keyboard with a standard Roland pitch/mod paddle, and adds newer features like easy preset access, D-Beam, and an effects section. External audio input and USB connection for playback – but, really, you can’t run the external input through the effects section? It’s just for playing along? Arpeggiator, phrase recorder and independent controller playback – taking a page from the success of the entry-level KORG gear, for sure. Taken together, I think Roland has a worthy rival to some of KORG’s gear at around the same price point. And it looks like a no-brainer to choose this over the larger SH-201. I love the panel layout; I think it just comes down to sound. And it’s a little sad that they couldn’t nail the sub-$500 price that made the original microKORG such a big hit, even if that would have meant cutting some corner. The folks I know at Roland have had a blast playing with it. And yes, that means something – just because you work for a company doesn’t mean you always enjoy it. I do look forward to trying it out. Keyboards like this are very often what get people hooked on synthesis and electronic music, and you’ll also find one or two sneaking into some high-end, celebrity studios for their playability factor. Click for full-sized image of the back.